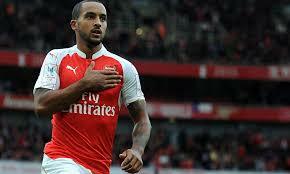 Akhil From Hounslow: Can Theo Walcott Make The Difference? I’m going to put myself on the line – Theo Walcott is the man to keep Arsenal in the title race (with the help of Mesut Ozil and a returning Alexis Sanchez in a few weeks)….as long as he stays bloody fit! Many argue that he does not have a trick or sometimes join the ‘not having a football brain’ bandwagon but he has two attributes that many dream about – pace and finishing. Even the football brain nonsense can be argued – the runs he makes have become intelligent and perhaps working with Thierry Henry has helped him too but in my opinion, he can make a real difference. Theo Walcott between 2010-2013 (before he was out for a year) scored 13, 11 and 21 goals in the three seasons when he played more games than he missed. I totally understand the argument about his fitness but when someone argues his ability to change a game or influence a game is questioned, I struggle to understand. The Spurs game a few years ago when he got bashed in the first half but came out for the second and scored two HUGE goals seemed to be a turning point – a few long drawn out contract negotiations meant there were a few hairy moments but Theo Walcott felt his place was at Arsenal and stayed. With Alexis out and Giroud playing the role of an inconsistent number nine and Ramsey still coming back into the goals, Theo’s goals could make or break a sustained title challenge. There may be games when he plays out wide and some he will play up top and it may even help motivate Giroud as it did earlier on this season. Theo scares defenders who tend to push deeper but the way Mesut Ozil is playing, many defences / midfields will be in two minds. Theo and Ozil from minute one away to Sunderland on Ozil’s debut seem to click when Theo could have had a first half hatrick with three Ozil assists! Let's hope for some more but this time it resulting in the ball in the back of the net. Big week in Europe and in the league at Villa and Theo could be key. I'm trusting in Sanchez and ozil and praying for Theo, I'd love for him to have more consistency it would rase him and the team. Mean time lets not over look Giroud and what he brings to the team !